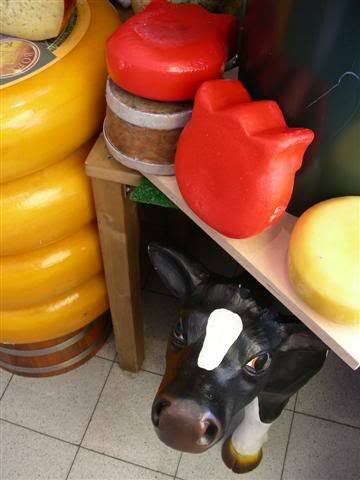 Yes, yet another cheesy post, taken from my archive photos as I take you on a virtual tour of one of The Netherlands best Specialist Cheese Shops: Ed Boele’s in the Fahrenheitstraat in The Hague. We’ve been looking at the Dutch cheeses on offer, and the Bleu’s from around Europe, but there are so many more to explore in the world of European Cheese. Of course, no shop could even start to hope to stock them all, there are literally tens of thousands of European cheeses, so Ed does the next best thing: he goes looking for the best of the best. 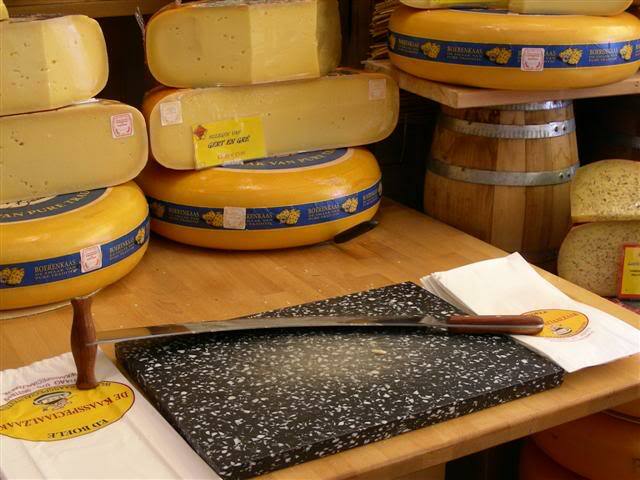 Ed Boele makes regular trips around Europe, sampling cheeses and bringing back some of the more exquisite examples to share with his customers. Not for nothing does he have Best Foreign Cheese Selection Awards to his name. One of the best things about both him and his shop is that not only are the contents divine but that he and his staff take the time to know all there is to know about everything they sell. 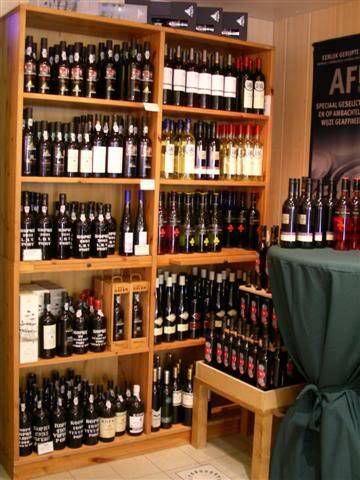 The awards they have earned over the years are based not only on a visiting senior industry specialist jury but also by multiple random visits by mystery shopper specialists so the staff have a good incentive to keep their knowledge up to date. 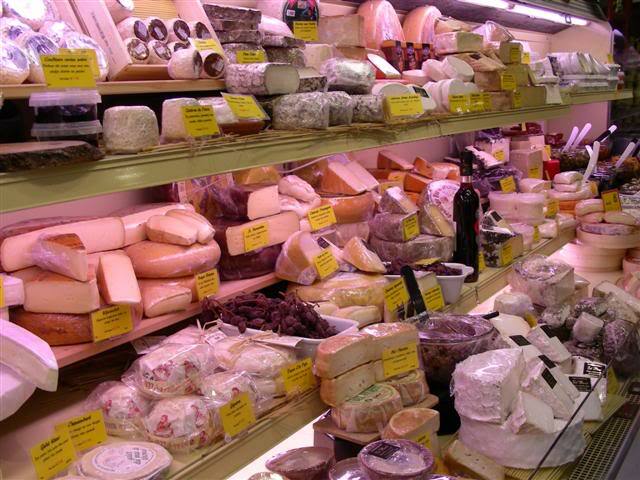 There are the artisan “Producteurs de fromages de chèvre” from the around the area of the Pyrenées, some are mild goat cheeses, other have a real kick to them. 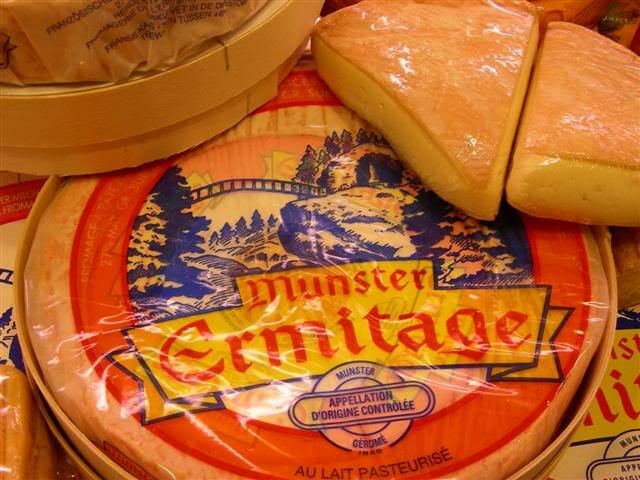 Made in the mountains of north east France, Munster or Munster Géromé, are the two names for one cheese. Monks here started making it in the 17th Century as a way of preserving the milk and to help feed the local people. 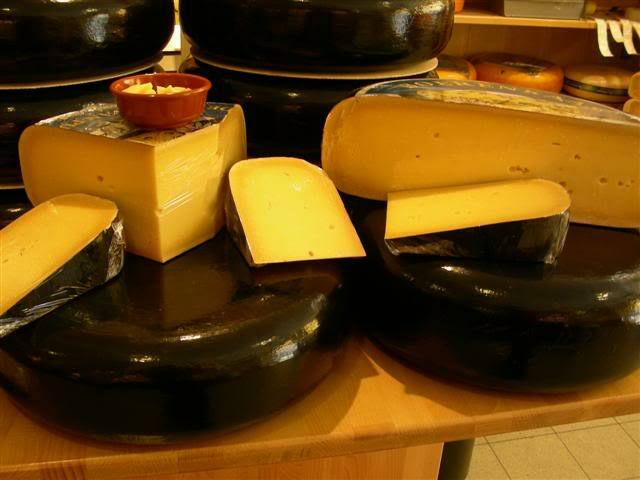 Milk comes from cows that graze the Vosgesmountains and is made into cheese by local farmers but bought to the natural cellars at Rochesson in the Upper Vosges to mature. In the cellars it is washed and rubbed for two to four weeks during which time the rind turns a soft orange colour and the cheese becomes soft and creamy. 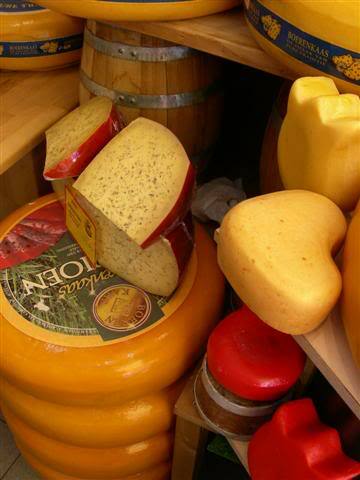 The cheese is still made the same way today and the recipe has little changed over the centuries. Ed Boele’s stocks “Munster Ermitage” , an award winning cheese from a company that’s been going strong now for some 70 years. 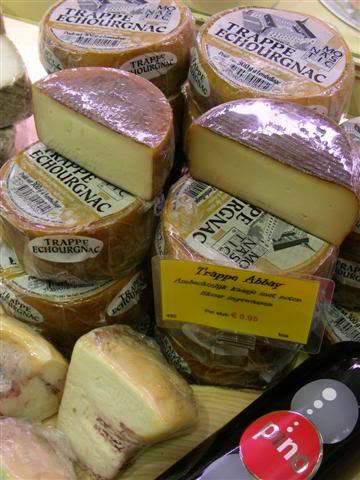 Trappe Échourgnac is a pasteurized cow’s milk cheese produced by nuns at the “Abbaye Notre-Dame de Bonne Espérance” (Abbey of Our Lady of Good Hope) in the Dordogne area of France. The Abbey was formerly called “Abbaye d’Echourgnac” and was inhabited by monks who made cheese here, but in 1910 when war broke out the monks left the abbey. Cistercian nuns came to the Abbey, bought with them the new name and picked up the cheese-making production where the monks had left off. The original cheese production started in 1868, when some monks from the Abbey of ‘Port du Salut en Mayenne’ came to Échourgnac and bought with them the recipe for Port Salut cheese. Over time the recipe was amended for local taste and has always been popular but in 1999 the nuns decided that it would also be a good idea to combine two local specialities: their cheese and a local walnut liquor, and so they did, with very successful results. The freshly made cheese is washed in the walnut liquor during it’s two month ripening time in the Abbey’s cellars, and this in turn produces a soft, smooth, creamy mellow cheese that has a wonderful walnut after-taste. (I like this cheese a LOT). From Cressier near Morat in the mountains of Switzerland comes Mont Vully cheese, it’s a “different” sort of cheese made in an area that’s the heart of Emmental style cheese country, so is not of the same style at all. This semi-hard Mont Vully cheese quickly caught the attention of cheese connoisseurs when it won a gold medal at the Käsiade in Tirol in 1998. 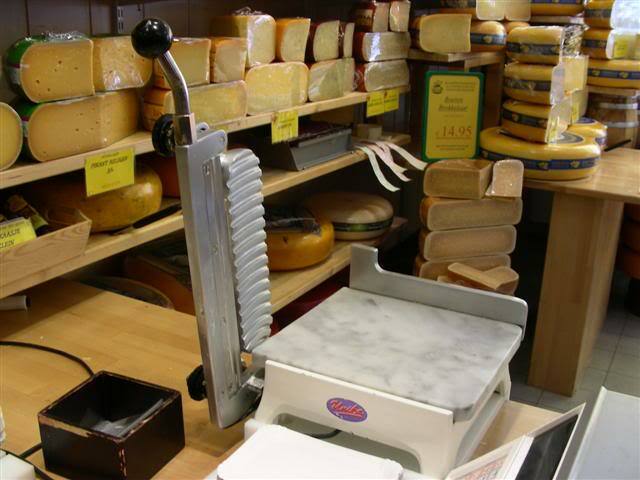 Adding the Swiss Cheese Champion Award for the Mont Vully Bio at the Swiss Cheese Championships in 2006 means that Mont Vully is clearly going from strength to strength. 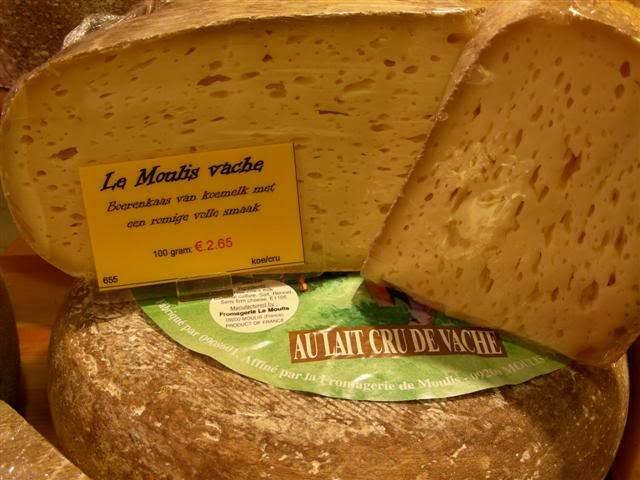 “Le Moulis Vache ” cheese comes from the Department of Ariège nestled next to Andorra in the Pyrenées and is pale, semi-soft mild-but-tasty tasting cheese with a flavour all it’s own. It’s charactorised by it’s distinctive small holes (I always think it looks like bread!) 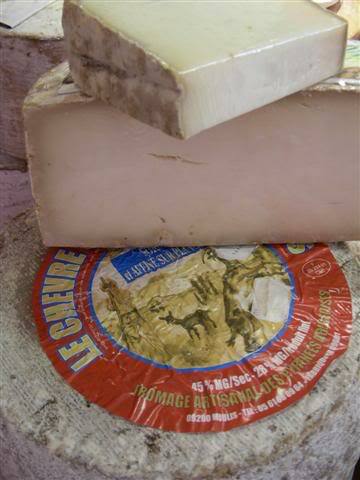 and is matured from between 10 and 12 months, an excellent addition to any cheeseboard! “Sbronzo Caciocavallo di Bufala”‘ is the strange looking cheese in the temperature controlled cabinet… it’s a cheese from Eboli, Italy, that’s made from unpasteurised water-buffalo milk and then aged slowly at precise temperatures. As is usual with hand made cheeses, the wheels are hand turned daily but this one differs from other cheeses because it’s also “dressed” with aromatic herbs, olive oil or vinegar or in the case of this one, grapes. Because the 10 month ripening process for this cheese needs to happen under exact temperatures, it’s one of the few cheeses in the shop to require a temperature controlled environment but apparently the end result will be a crusty looking, sweet aromatic cheese and I have no doubt that if the rest of Ed’s stock is anything to go by, that it will taste rather good too. Of course these are not the only non-Dutch cheeses in the shop, these are just a small sample of what’s on offer to show you the benefits of having a shop that’s dedicated solely to something as delectable as cheese and a staff who know their stuff. Like any society, The Netherlands has things that annoy you and things you adore. 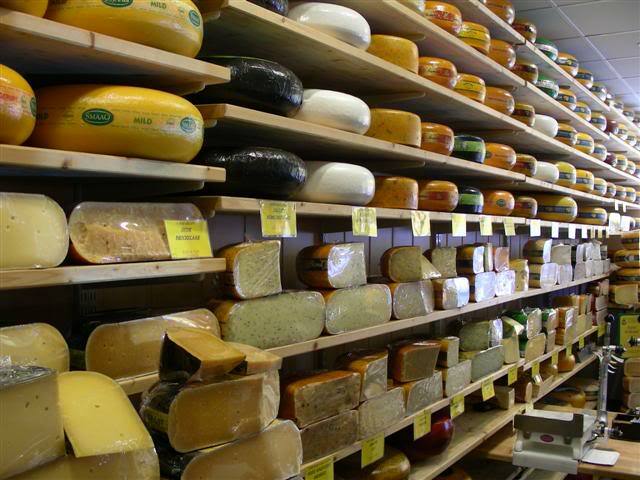 In the case of the traditional Dutch cheese shop, I think it’s an idea par excellence… after all there’s sure to be something in here to suit everyone’s taste, so what’s not to love? 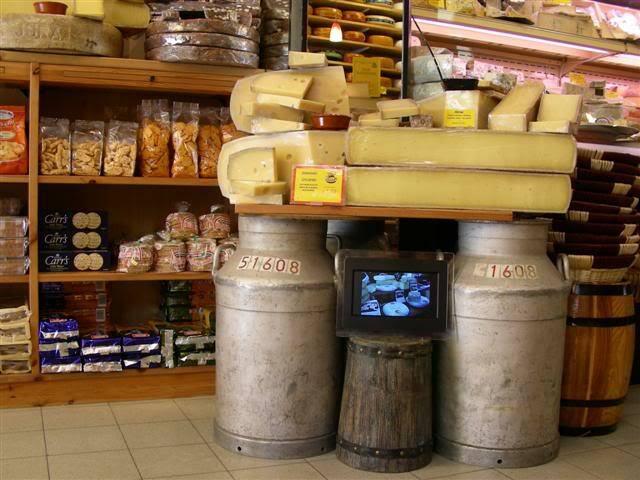 I’m taking you on a virtual tour of one of the Netherlands best Specialist Cheese Shops: Ed Boele’s in the Fahrenheitstraat in The Hague. 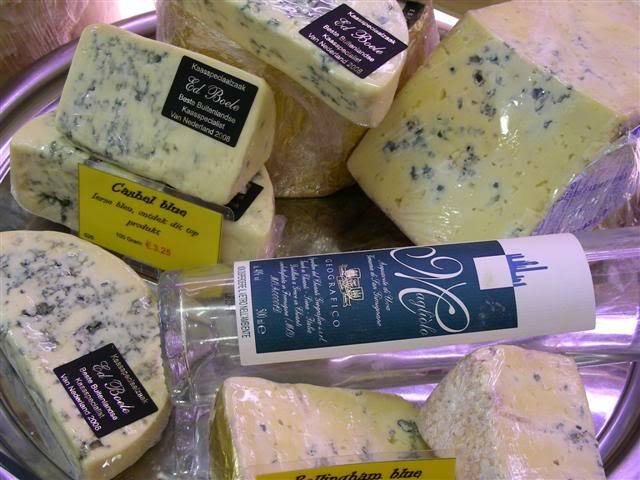 This post is about a type of cheese that people either love or loathe, the Blue cheeses. For me since I’m allergic to mould, it’s simple, these cheeses are full of the stuff and not for me, but Himself is a lover of the Bleu’s and indulges whenever he gets the chance. Like many food variants around the world, the first blue cheeses are said to have been derived from a serendipitous sequence of events, but the origonal “where” it all took place remains ambiguous. Caves have long been the natural cellars and ally of the cheese maker, temperatures remain more constant and the cool dark of the caves meant that cheeses could mature well. Various fungi such as Penicillium Glaucum or Penicillium Roqueforti are commonly found in caves that sport the right conditions and cheese makers found that cheeses stored in the caves to mature took on the spores of these fungi and slowly inherited the blue or green veined texture that is so prized by blue cheese lovers today. 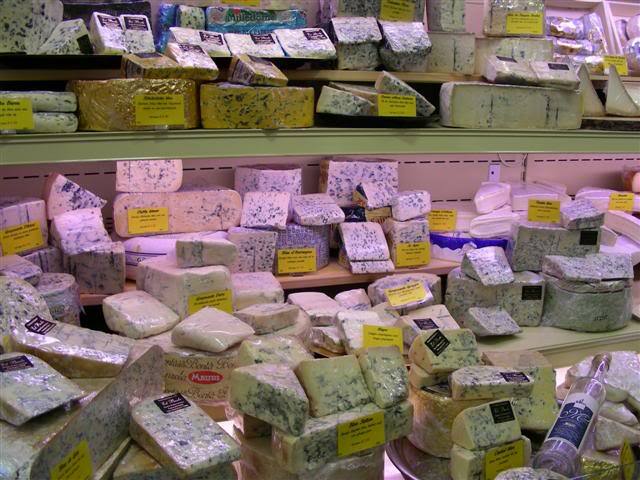 Be they the famous (Italian) Gorgonzola, (English) Stilton, (French) Roquefort , (Spanish) Cabrales , or (Danish) Danablu, these cheeses are soft and creamy with streaks of blue or green mould running though the cheese. These cheeses are made from cows, goat, sheep milk or a combination of them all and are generally strong, both in smell and taste: often spicy, tangy with an edge that sets them apart from other cheeses. Hand made bleu’s (blue cheeses) are still “needled” which means they have the air injected into the cheeses by hand, the air feeds the mold that is naturally occurring in the cave and so the process begins, but factory made bleu’s these days probably have the mold mixed directly in with the curds, to ensure an even distribution. 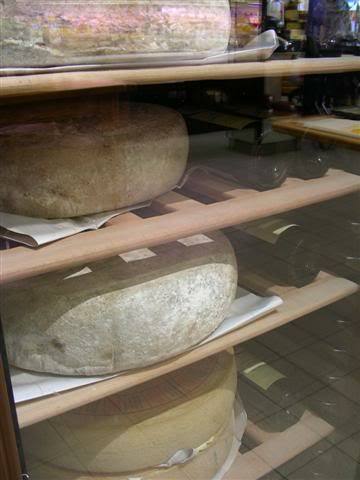 In most cases these famous cheeses are returned to the caves where the mold occuers to be matured and like all cheese, the longer the ageing process the better the texture and the more intense the flavour. 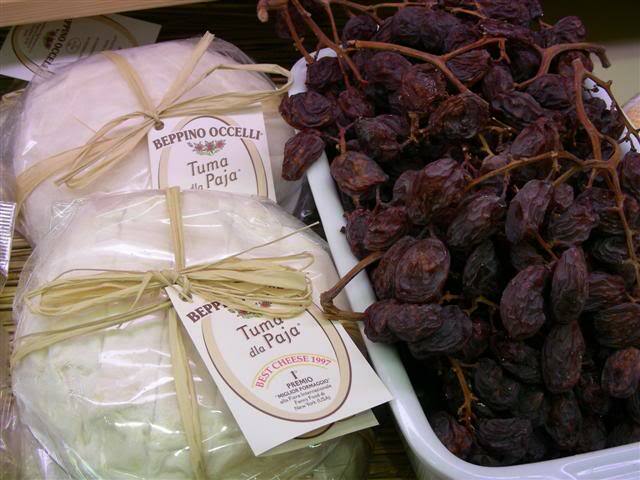 Today, most cheesemakers use commercially manufactured Penicillium Roqueforti cultures that are freeze-dried. The best advice that Himself gives is that while most bleu cheese lovers instinctivly go for the “big names” of Gorgonzola, Stilton, Roquefort , Cabrales , or Danablu, that if you ever have access to this kind of cheese shop that you should try a few of the other lesser known names because there are some gems of blue cheeses to be had that are not on the ‘big name” lists. 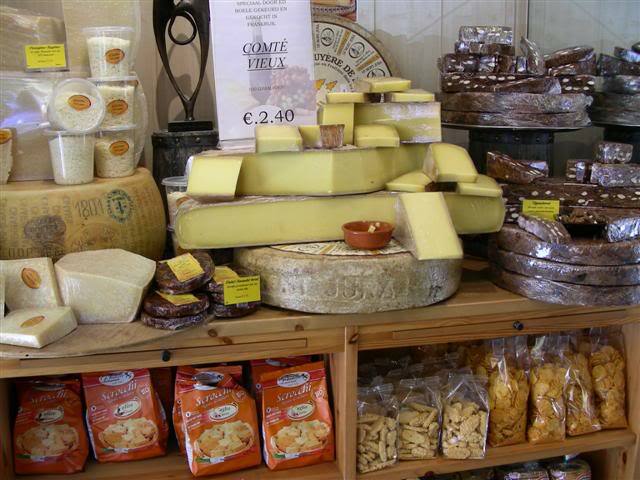 Since these speciality cheeses are not easily opened for tasting, asking for a piece to try from each packet is usually not done, besides, the cheeses are soft, expensive and sold in small increments of 100 grams rather than by the kilo of their Boerenkaas counterparts. 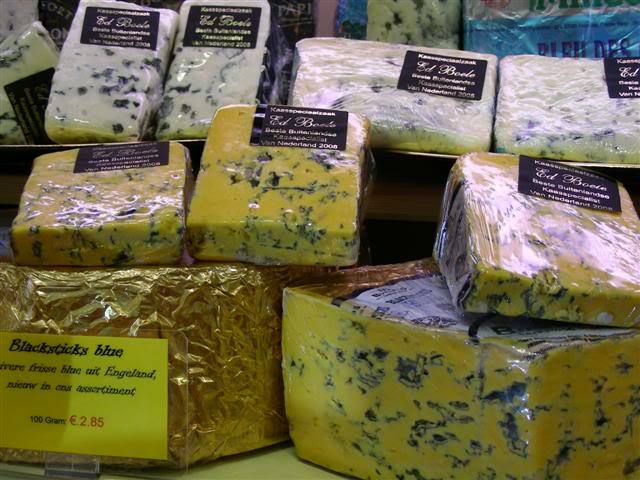 However, in a place like Ed Boele’s it’s usual for a few of the Bleu’s to have their own promotional tasting plate at any given time, so if you like your cheese Bleu, Himself recommends a taste test each time you visit so that you might discover some of the ‘other’ magnificent bleu’s on offer. 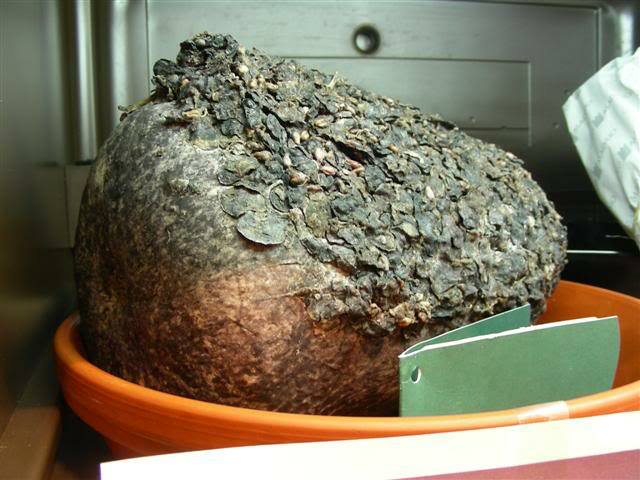 Groves of Cloves, Seeds and Nettles… in my Cheese! 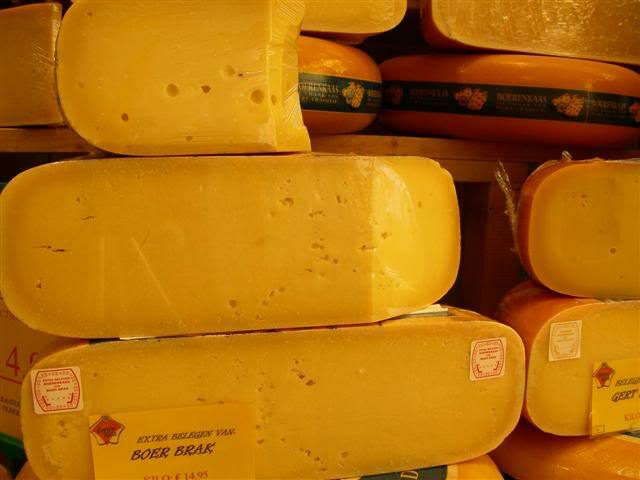 Yet another cheesy post, taken from my archive photos as we take a virtual tour through one of The Netherlands best Specialist Cheese Shops: Ed Boele’s in the Fahrenheitstraat in The Hague. 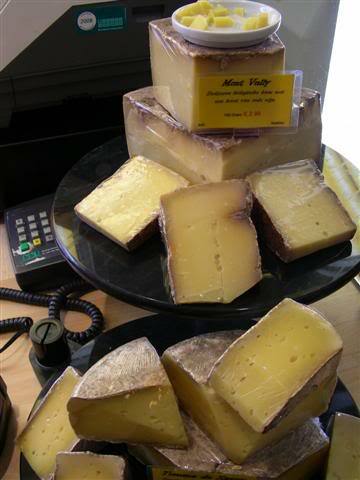 Plain cows’ milk cheeses are of course what the Dutch are famous for. 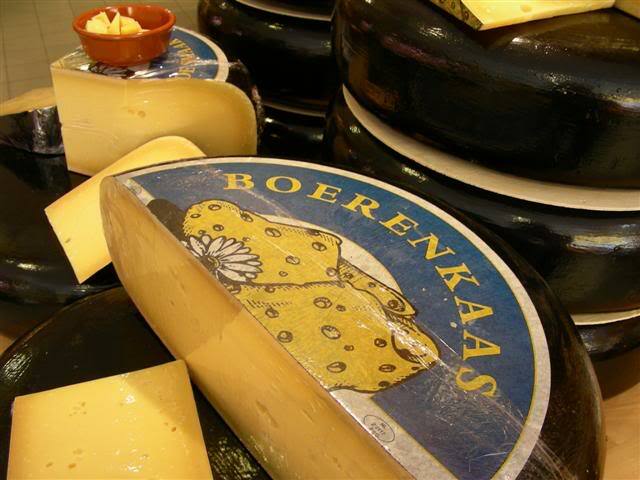 The Dutch have both in the past and present, exported not only vast volumes of cheese, but also the world-famous back and white super-milker, the Friesian Cow too. 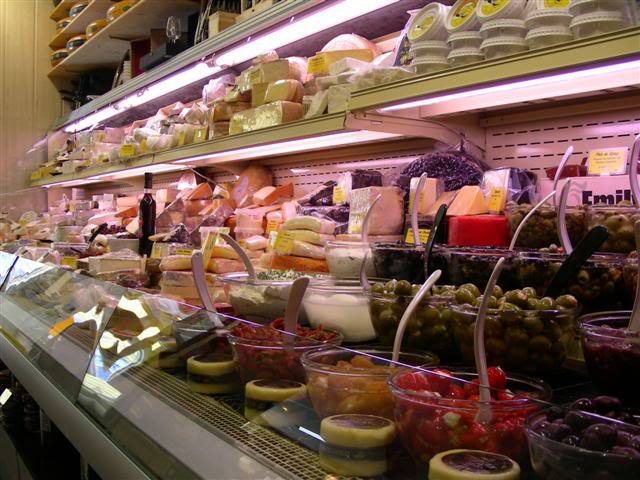 But of course not just cows produce milk… there are also goat and sheep cheeses available in every cheese shop. Usually quickly identifiable by their very white colour, these cheeses are often accompanied by a distinct sharpness, even in the young cheeses, and this can be an acquired taste. When I first came to live in The Netherlands I found these far too strong for my taste, but this is where the little slip of cheese tasted in the cheese shop comes very much in handy. Over the years I have tried many a little slice of goat and sheep cheese and yes, to be honest most have been beyond me, but over time, I have found several exceptionally tasty but also mild sheep and goat cheeses that I can now enjoy. It’s always worth a try and who knows, maybe you’ll find one that suits you too. Then there are the “cheeses with bits and flavours”. Cheese makers are Foodies after all and what true Foodie doesn’t like a little culinary experiment? 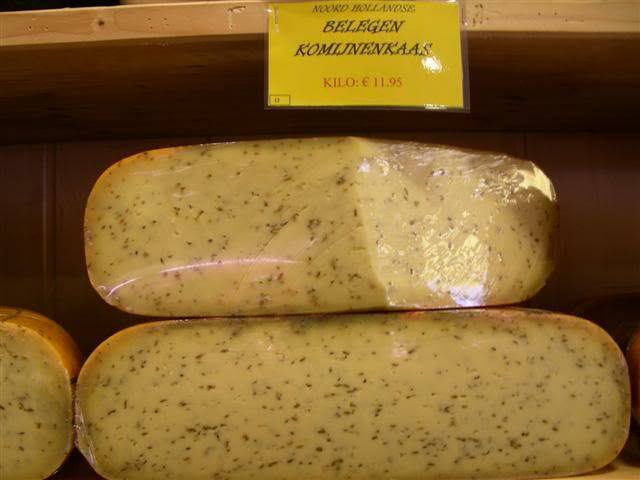 “Brandnetelkaas” (stinging nettle cheese) contains, you guessed it…. stinging nettles. …and No, they don’t sting at all once they are in the cheese. 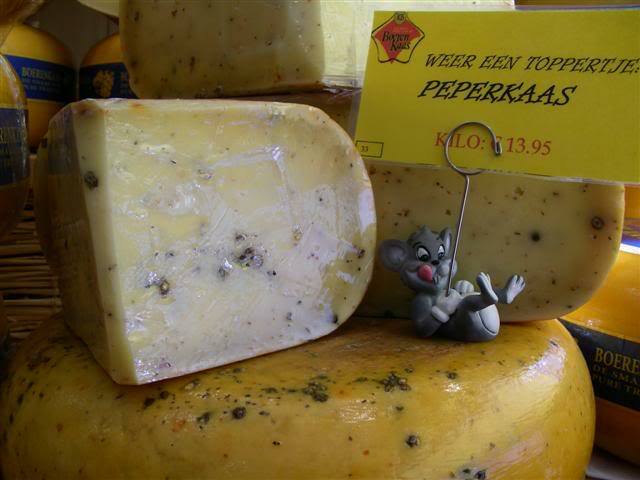 There is a distinctive taste to it and it comes with small green pieces of stinging nettle mixed throughout the cheese. Personally, I’m still working on liking stinging nettle cheese, not because I actively dislike it but rather because I have a long list of other cheeses-with-bits-and extras that I like even better. 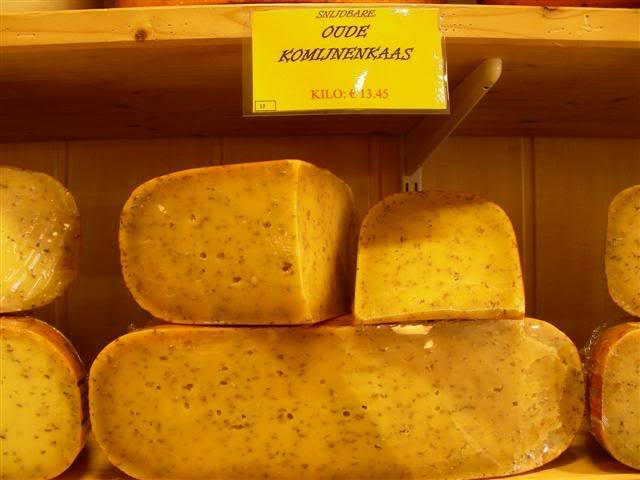 ‘ komijnenkaas‘ (cummin seed cheese) This is another of the ‘acquired taste’ cheeses and personally, I like it in small quantities. I have stood in the shop in times past and watched in wonder as I waited my turn as customer after customer before me buys a slab of cummin seed cheese with their regular order of cheese and I’ve been facinated at the apparent national appitite for this particular cheese. It’s so popular you can get it country wide in any cheese shop. 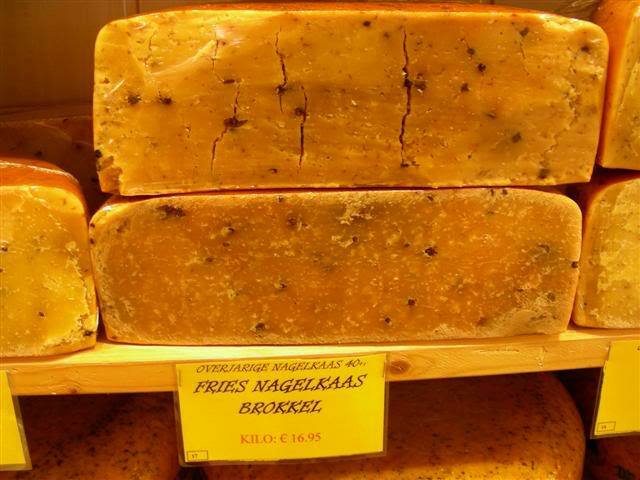 ‘kruidnagelkaas‘ (clove cheese) This cheese is a must for any true lover of cloves… and one of my personal favourites. (*) a small note about the westfriese-kruidenkaaas I mentioned earlier, it’s fabulously delicious “as is” on crackers or bread, but I wouldn’t recommend cooking with it because I tried twice. First to make a herb-y cheese sauce and second to mix with hot pasta. Both times it the result was excessively salty, even though I added no other salt to the recipes. You win some, you loose some, cooking with this one was a definite fail. 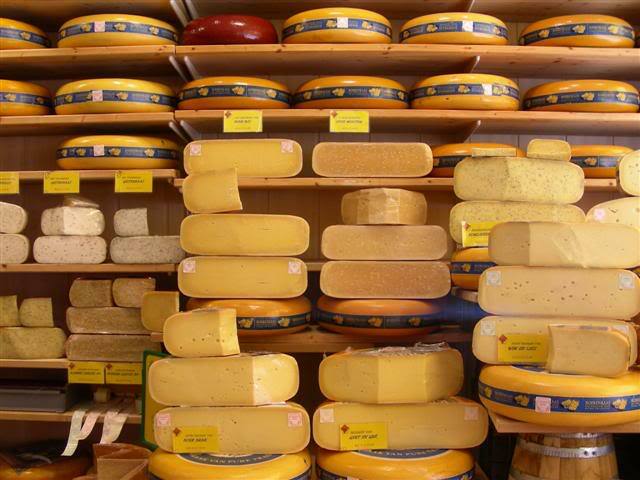 These are just a small selection of the Dutch cheeses on offer… now you see why a shop that specialises in just cheese is such an excellent idea here in The Netherlands… but I’m not finished yet! Here are some more of my archive photos from one of the Netherlands best Specialist Cheese Shops: Ed Boele’s in the Fahrenheitstraat in The Hague. I have inquired about the possibilitiy of being able to visit one of these farms so that I could document the process but it’s harder than it sounds due strict health and hygiene regulations that require that the general public be separated from the manufacturing process of food by glass or perspex screens and other regulations to protect the public from themselves or others around various heavy machinery. I will endeavour to keep looking to see if it’s possible to find a Dutch dairy that will give me a tour and let me take photos, you never know I may hit the jackpot one day. Surprisingly even though the Netherlands is not a large county and the farms are small, the cheeses made in the farmhouses vary considerably in taste. texture and quality. Each farm has their own way of making the cheese, the recipes differ, the type of rennet used, the amount of salt, as do the methods of ageing, the fat percentages in the milk, the strength of the taste is often to the regional preference and even what the cows ate for breakfast yesterday makes a difference. In general farmhouse cheeses are made with full whole fat, non-pasteurized milk that in turn produces a young, a medium aged, old or very old cheese, and so if you only wanted to compare the most basic of the 200 farmhouse cheeses you would be looking at at least 5. 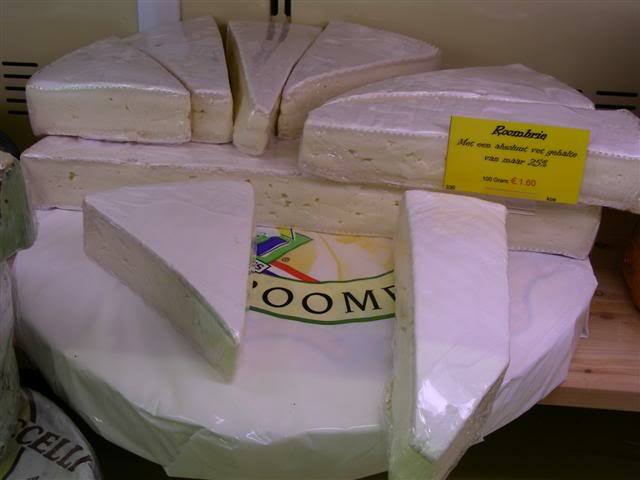 000 cheeses without even beginning to consider the goat milk, sheep milk and other varieties. 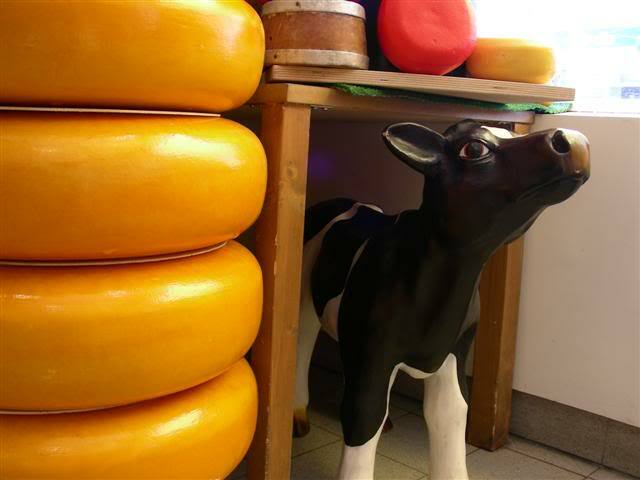 Ed told me that he visits farmhouses all over the Netherlands and tastes the cheeses for himself. Slowly over the years he has built up a selection of some 20-30 favourites, and there are usually at least 20 of these in the selection of “farmhouse cheeses” in his shop at any one time. 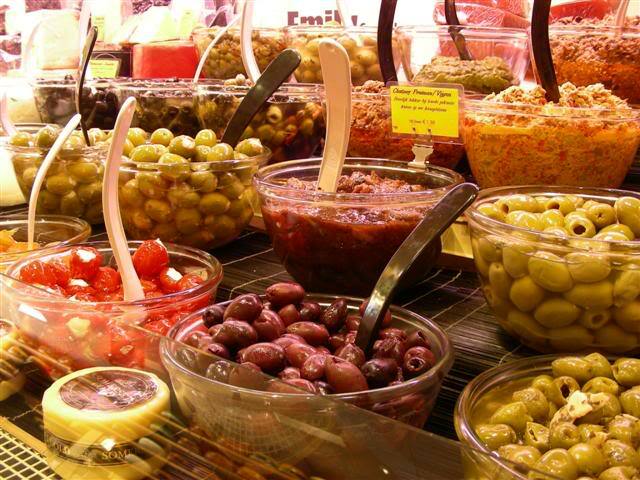 We can attest we, like his other customers agree with his selection: there is always a queue for these cheeses and little plates with cut cubes for tasting are popular. 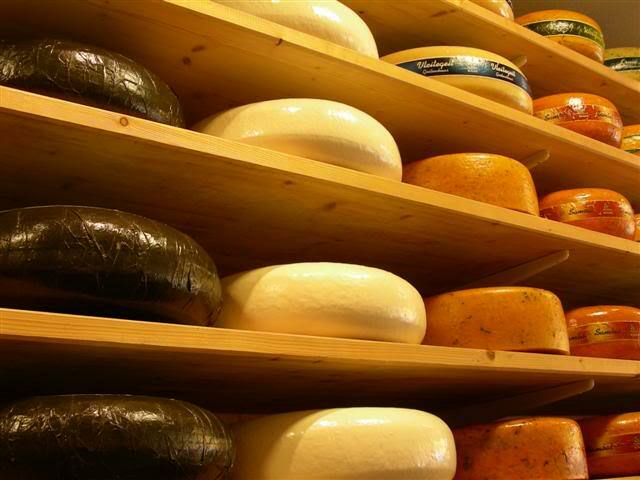 Not that it would matter if there was no little plate… it’s standard practice in The Netherlands to ask to taste these cheeses before buying, they will expertly slice off a sliver of cheese with a cheese-knife and you may compare several before making choice. A word of warning to the newbie cheese taster: It’s entirely possible to taste so many fantastic cheeses that you end up exiting the shop with three or four of the five cheeses you tasted instead of just the one you intended to buy. More than once in the past after a cheese shop dalliance have Himself and I ditched the evenings planned meat and salad menu and instead bought some crusty bread, pâté, crackers, cherry tomatoes on the vine and settled down on the sofa that evening with our decadent cheeseboard dinner. At the farmhouse the cheeses are put into round wooden forms that are called “wheels” and are made into these flat rounds because this shape ensures that the ageing process is nice and even throughout the cheese. All hand made cheeses are turned regularly so that the moisture inside evaporates evenly as possible as the cheese matures. 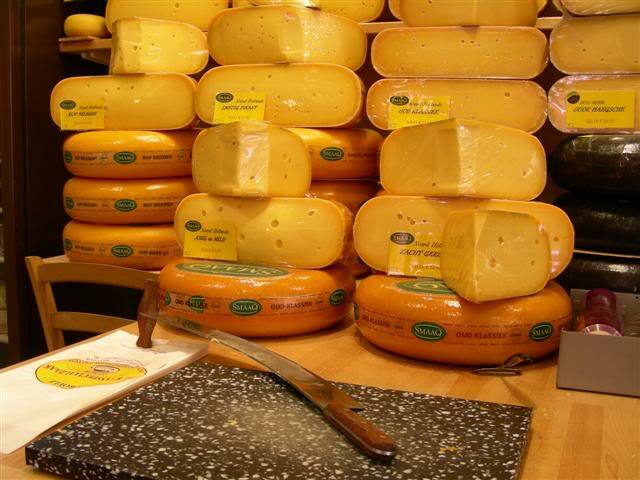 The shop also sells a few of the 15 Dutch factory made cheeses, which are generally made from pasteurized, skimmed milk instead of the unpasteurized full milk of the Boerenkaas and often has a higher salt content. Factory cheeses have the bonus of being cheaper and melting at more consistent temperatures, useful in the food industry and in cooking. There’s a factory cheese called Cantenaaer that Himself and I think rivals the handmade cheeses for taste, so it’s not necessarily about first or second rate quality, they are just different and there is plenty of room for both. Ah Chef, an Express to India? I’m still on the road to recovery, and haven’t been in the kitchen for ages. Himself has been cooking, meaning that we’ve had an awful lot of his speciality menu or close variations thereof: plain boiled pasta and quick to make veggies like broccoli, peas, sugar snaps and sweetcorn. Don’t get me wrong , I like all of this, it’s just that I like it less four times a week for months on end. Friends told us that there was a new Indian take-a-way, different to others here in the city in that the chefs were formerly UK based and have come The Hague and set up a British style Indian Restaurant. I’ve heard excellent things about many UK Indian restaurants but never been to one, so when friends of ours got food there and were impressed. I pricked my ears up. The other day, Himself and the kids went after school to Oma (Grandma’s) to do some shopping, general chores and to cook, and knowing that they would all out to dinner there, I opted for a take-a-way at home at lunch time. There is a website, but I have food allergies so phoned them so that I could ask about the contents of the various dishes and to ask about the levels of spiciness on offer. The staff were friendly, and after a few questions about my preferences and the allergy checks, I decided to order the Lamb Karahi, Garlic Nan bread and rice. The heat levels available were mild, medium and hot and I choose medium so that I could gauge my heat tolerance against their levels of spicy. 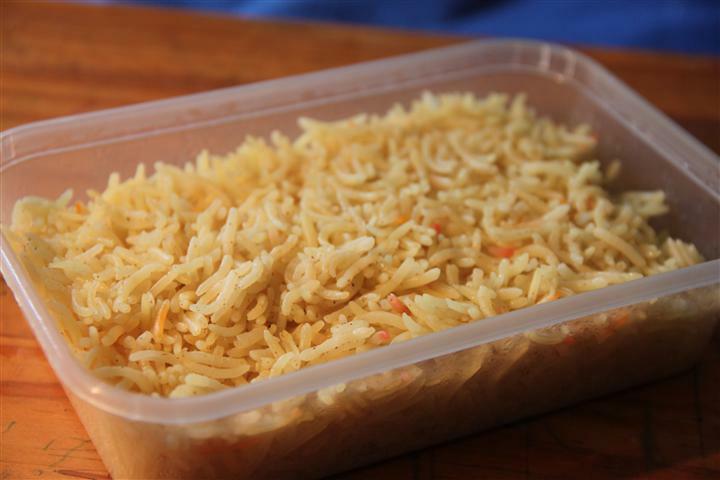 I discoverd during our telephone conversation that the home delivery service is only available after 5.00p.m. (at least at the present time) so we arranged that Himself would pick up the food that they said would be ready in 4o minutes. Since Himself was running to a tight work schedule he only left the house some 40 minutes later so I was worried that the food would have been left standing and cold, but the chefs are rather disorganised and Himself had to wait another 10 minutes after arriving before the food was even ready. Himself did however confirm their friendliness, and remarked that he was pleasantly surprised at a nice looking meal for Euro 14,– not too expensive at all. 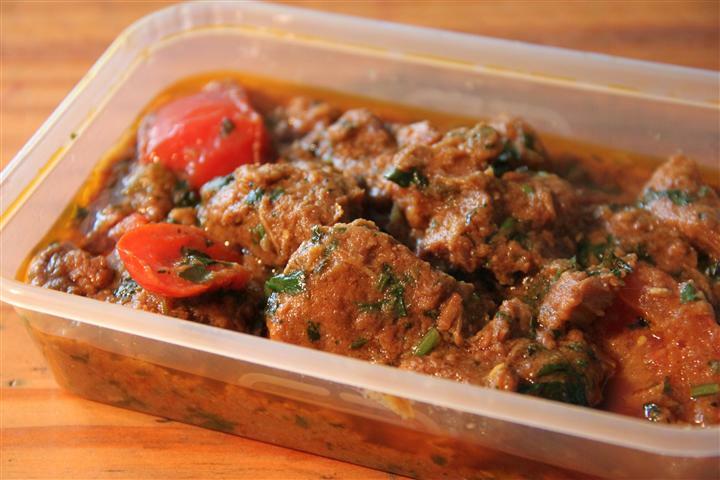 I was pleased with the taste results, lamb in it’s sauce was delicious, but one small detail detracted from the meal, quite a few bits of the lamb had a lot of fat on them, what a pity since that bits without lashings of fat tasted brilliant. I was surprised at the heat factor… clearly my tolerances for heat are greater than I thought because my “medium heat” meal had a pleasant after-taste of heat but really wasn’t what I would have called hot, next time I will have no hesitation to choose the “hot” version. 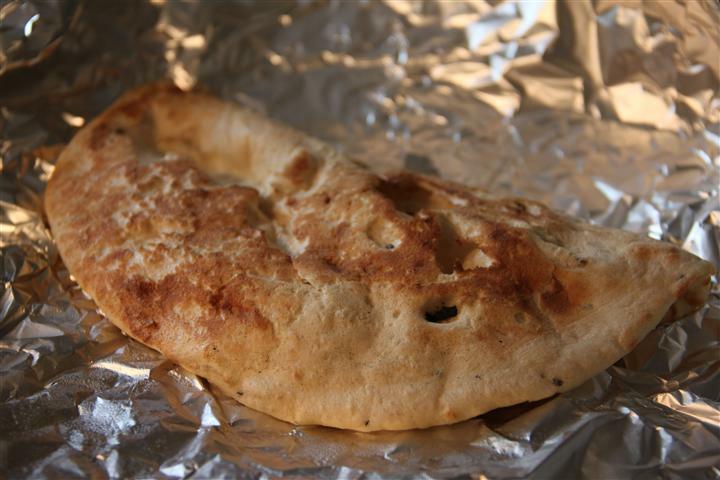 The garlic nan bread was good, very tasty, but I also wouldn’t have minded an extra-garlic option on it. Somehow I missed ordering pompadoms, ( I couldn’t find them on the menu and I forgot to ask when I phoned) …pity because for me no Indian meal is complete without them. My final verdict is that this is one of the best Indian meals I have had in The Netherlands, and that I would be very pleased to order from here again. I do hope though that they can trim a little more fat off their meat and that they can become a bit more organised. That said, this establishment is very new on the scene, they are ex-pats who will be still finding their way into Dutch living and their learning curve will be rather steep at the moment: especially as they will eventually have to master the Dutch language as well. Of course for me a switch to the English language was no problem at all, and naturally a British Indian restaurant will initially build up a fairly instant following amongst the English ex-pat community here in The Hague, so they have time to gain some Dutch as they progress. Early days and it’s looking promising… I’m keen to check out more of their menu in the near future and see how it measures up to the lamb. The few weeks ago we had ‘one of those days”. Parents of multiple offspring will be all too familiar with what ‘one of those days” looks like in action. Little Mr had helpfully bought home a head cold that involved a lot of sneezing and even more “didn’t get hand to cover mouth in time” moments, coupled with me nagging calling him, after every sneezing fit to demand that he squirt some antibacterial hand gel on his hands. Little Mr. has this year taken a deep aversion to washing his hands with soap and water, but is very willing to use the travel antibacterial gel that I bought to use for when we fly… so I decided to choose my battles and let the kid smear on the gel so that he can avoid the water. Yes, he gets a total scrub down in an almost daily bath, and that water is fun and the real battle has been getting him to wash his hands after visiting the lavatory, before dealing with food, or after coughing or sneezing. He’s sick of my nagging, Himself, Kiwi Daughter and I are just sick. We are all ratty, the kids are having constant cross words with each other since they got up this morning and now, after school, are sniping over minuscule details of stupid nothiningnesses. Himself is in the kitchen trying to cook, but being interrupted literally every minute by one kid of the other telling tales and seeking revenge/punishment on the other, things start to go wrong in the kitchen because the cook is already tired and is being distracted way too many times to any attempt at multi-tasking. Himself’s responses to the kids start to get a little ragged around the edges, the volume rises and when the kids continue to fight, Himself starts yelling. Himself isn’t coping with this well, this is clearly a time when Kiwidutch needs to slip in her Meanest Mama costume and come to the rescue. Both children are summoned, they stand before me in the hallway, trying to covertly elbow and kick each other… I have come prepared with pens and paper and order them both into the bathroom (that’s a real bathroom for my North American readers, our toilet facility is a separate entity). The floor is linoleum, it’s smooth, hard, cold. Both kids are ordered to park their behinds on the lino. They each receive writing materials each and a task. 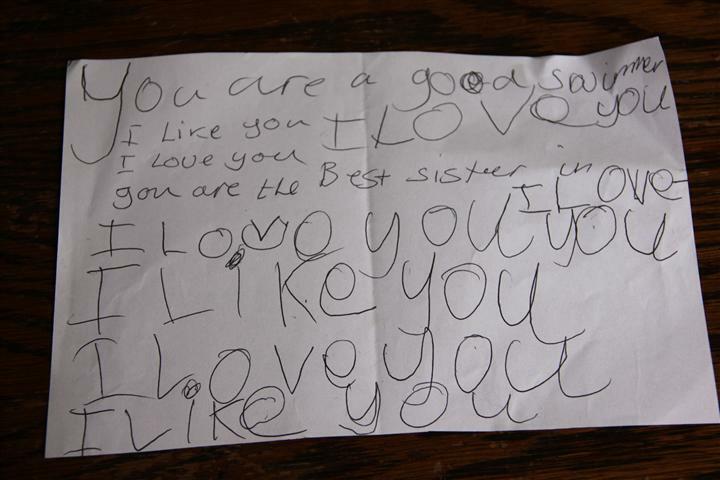 They may leave the bathroom once they have each completed a list of “Ten Things I Love about My Sister/Brother“. The howls of rage, indignation, and mal humour show me that they think that coming up with World Peace is probably easier than they thought this list would be, but I shut the bathroom door on them and ignored the nasty noises they made to each other on the other side. After some ten minutes of bikkering they realised I was serious and echos of “we are sorry, can we come out now?“came though the door. “Finished your lists?” I said… no, they hadn’t started yet. “Two finished lists please and you may come out“. The loud protests resumed and once they realised I wasn’t listening (OK, I was listening, I just wasn’t responding) , they turned on each other and bitched that there was nothing good they could think of to write about each other. After a long forty minutes they finally realised that they had seen more of the lino floor than they really wanted to and started to work together. Kiwi Daughter at ten years of age realised that even if her list was ready, if Little Mr’s wasn’t then she was going nowhere. 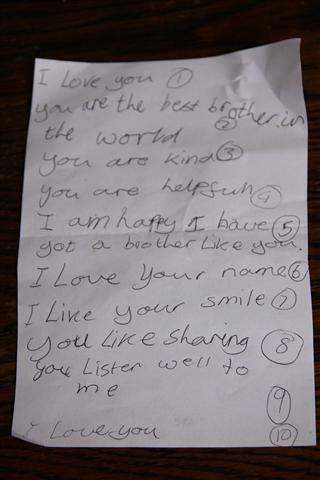 Little Mr hadn’t even started his list and rather rudely declines her help but after several minutes the penny drops and he starts to write down what she dictates to him. The punishment has taken some fifty minutes (not actually what I intended) but the upside is that Himself has finished dinner quietly in the kitchen and had a chance for a fifteen minute power nap so is feeling a bit better. The kids are released to the dinner table and the real result is seen a bit later on in the evening when after they go to bed, himself goes to check on them and finds Little Mr cuddled up to his sister in her bed. He transfers the sleeping Little Mr back to his own bed and comes out grinning to tell me. The added bonus of this Meanest Mama episode is that when the fighting and drama has been getting out of hand on subsequent days, hints about pen, paper and lists has a certain sudden calming effect on my kids. Strange that. 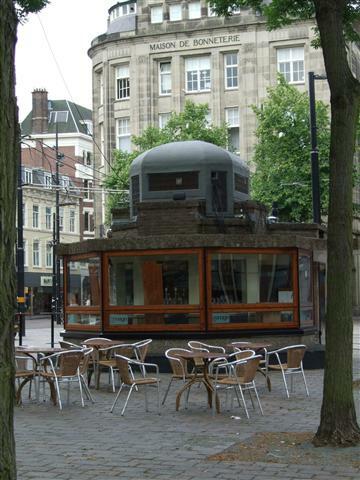 You can’t complete a visit the Centre of the Hague without seeing this little gem of a building situated on the Buitenhof. 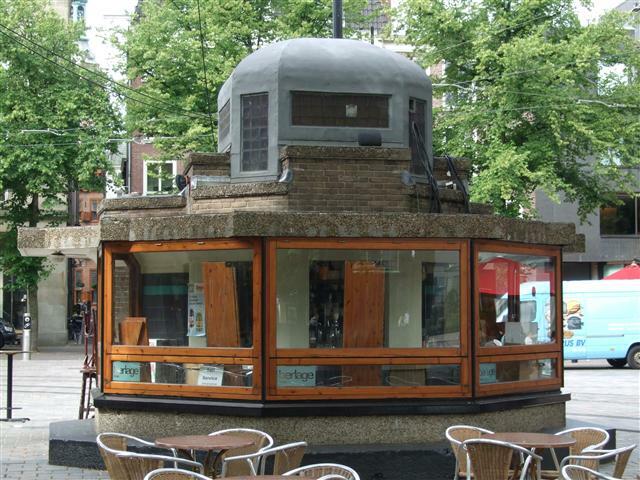 It’s a beautiful little kiosk designed by Hendrik Petrus (H.P.) 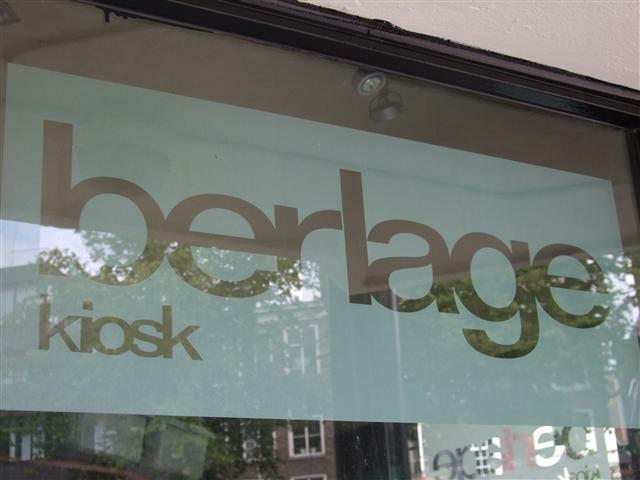 Berlage, (1856-1934) one of The Netherlands most notable architects. Berlage was a student of Gotfried Semper, who taught the renaissance style and held to the idea that the use of ornaments should not be a goal in itself. Later, the works of Viollet-le-Duc made Berlage see that a historic style should not be copied when designing a modern building. As a result he started to look for a new rational style, using geometrical plans and geometrical shapes. Berlage was influenced by the Neo-Romanesque brickwork architecture of Henry Hobson Richardson and the combination of iron and brick in his structures. Together they believed that elements of the ironwork in construction need not be hidden but could become part of the overall style of the building, so sometimes these elements are made decorative but often they stand just as part of the structure without being covered or disguised. Considered the “Father of Modern architecture” in the Netherlands and the intermediary between the Traditionalists and the Modernists, Berlage’s theories inspired most Dutch architectural groups of the 1920s. Important buildings that he designed include: the St. Hubertus section of the Kröller-Müller Museum, the Gemeentemuseum Den Haag (City Council Museum the Hague), the Amsterdam Commodities Exchange, the plan for extension of Amsterdam, the ‘Plan Zuid’ or ‘Plan Berlage’ and the Berlage brug (bridge) in Amsterdam. 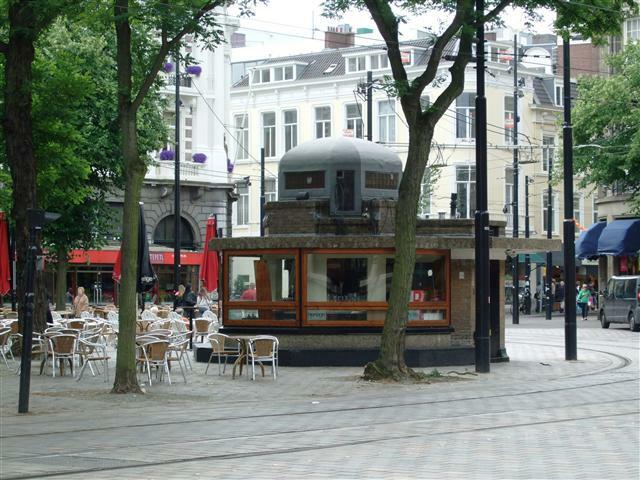 The little kiosk was built on the Buitenhof in the 1920’s when the area was being renovated, and was designed in partnership with P. Black. 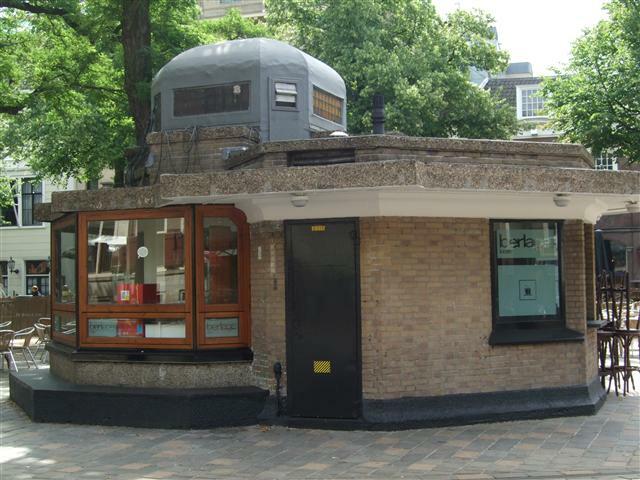 Together the pair worked in a compact design of two concentric octagons and in 1924 it opened to sell flowers, magazines and newspapers on it’s street level and a ladies restroom on the underground level. The design of the dome allowed light into the ladies restroom below ground. 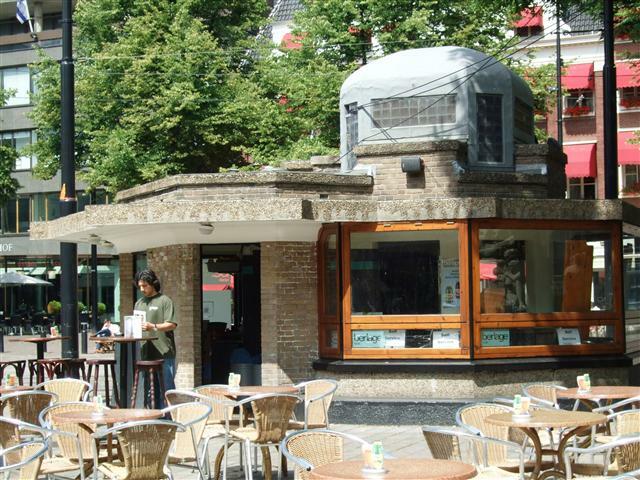 There was also apparently an additional gent’s urinal on the other side of it but information on The Hague’s website page http://www.denhaag.nl/home/bewoners/to/Kiosk-Berlage.htm tells me this has been closed since 1963. 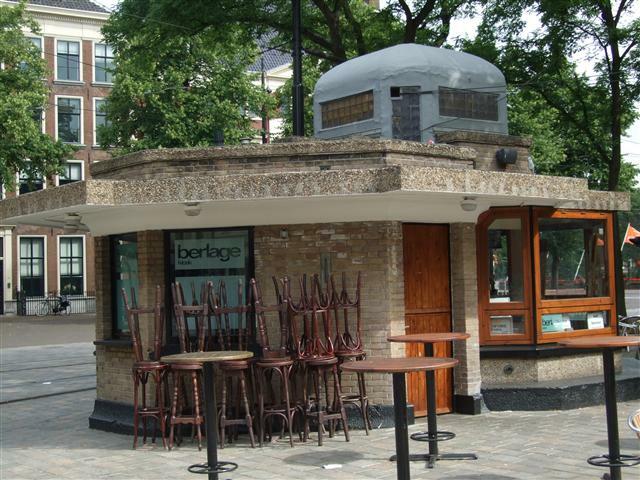 In 2005 the berlage kiosk had it’s dome painted white whilst being renovated, but this changed it’s look so dramatically that there was a public outcry. 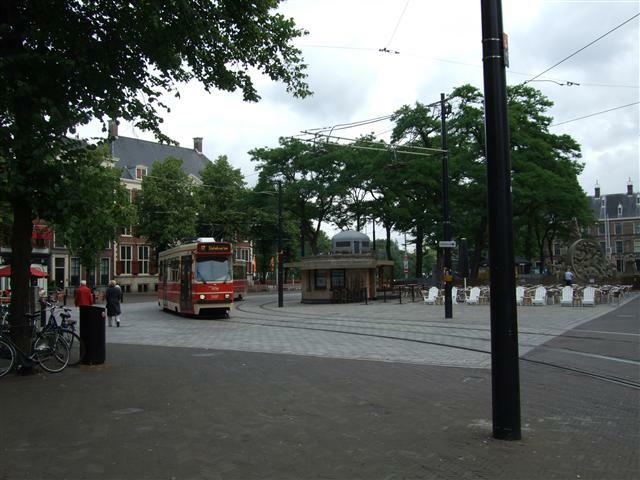 Both public opinion and the fact that the building also enjoys Monument (listed building) status, saw the Berlage roof quickly returned to it’s characteristic grey colour that so well suits it’s design. I’ve taken these photos of it at various times of the year, when it was open and when it was closed… I’m sure that one day when I’m back on my walking tours again, there are sure to be more photos to take of it in the future too, because I simply can’t resist this photogenic little building. As many of my regular readers know, I’m slowly recovering from an accident I had in November 2010. I spent until February in plaster, seven casts in total and have been a regular with a rehabilitation specialist, surgeons and physiotherapists since then, as we work hard to get my distrophic foot back into working order. We have progress, definite progress: not the sort of thing that you can see on a daily or weekly basis but over months it clear that the amount of flexibility and pressure I can bear is ever growing and that my exercises are getting progressively more intensive and extensive.After some frustrating months at the beginning of the year I demanded a long term projection for recovery and the surgeon said “best case scenario = Christmas this year, worst case scenario = next Summer“. At this point my plotted course of ever increasing graded activity is going well, it’s painful and it’s tiring but we just keep plodding away at it. Being off crutches by Christmas has already been ruled out at this point, but there is hope that that might happen early in the New Year for short distances at least. Meantime I have been trying to make the best of my recovery time, of course most days that means exercises, sleep, work and since everything on crutches takes a stupid amount of effort nothing gets done in a hurry. As others rush past in the fast lane of life, I am chugging along in the slow lane hugging the hard shoulder of life. At least the engine is still running, but the slowness does get to me some days. That’s normal, and I’ll survive it, boredom and frustration are not usually life threatening unless you add extra stupidity and my new middle name is ” mega-cautious”. Anyway, you usually have to catch stupidity with both hands and mine are firmly on the crutches. … and Himself will tell you that I’m the worst catcher in the whole world (if you don’t count colds). The silver lining to spending vast amounts of time cooped up at home resting has been that my asthma has been good this year. I’ve dodged three colds that Little Mr shared around, each of them being more annoying than nasty and giving me a head like a brick but not lung problems, after several days they departed and I was a happy bunny again. In recent weeks though I’ve been nursing a cold that doesn’t want to give up. 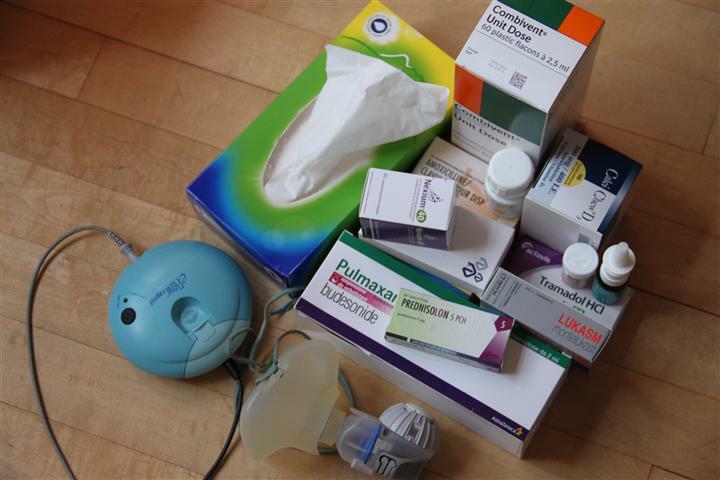 My lungs are chemically damaged and my asthma is severe, so a bad cold needs to be taken seriously therefore after a week of coughing and sniffing I phoned my Lung Specialist and we did a telephone consult of symptoms and medications. I have my own portable nebulizer so try to avoid necessary additional hospital visits if I can via an arrangement where I let the Lung Specialist know when things are getting out of hand and he faxes though prescriptions to my local pharmacy so that we can hopefully intervene in the early stages of a bronchial meltdown. We did that last week but the coughing is worse not better so Himself dropped me off Monday for an emergency visit. Yuck and darn, Bronchitis. The coughing on the hard shoulder of life has now turned into a small pit-stop in one of life’s lay-bys as I tank up on enough drugs to equip a third world pharmacy. The cards I got dealt on the health front in the last year have been a pretty lousy hand, but I’m not folding, let’s look at it positively, I may have slipped from First to Neutral right now but at least it isn’t Reverse! Once again I’m appreciating your comments and support, the main reason I’m not replying much is that I’ve concentrated on getting a lot of blog posts up whenever I have a good hour and have no energy left over for the rest. Life IS still good, it’s just got a running nose, sore throat and constant cough at my place so it’s in bed laying low. I’ll be back to my chattier self soonest I promise!